Many people comment that I crochet fast. I’m not really a fast crocheter as I have seen women totally bulldoze me over with their speed. My friend, Onzelle from Pennsylvania who I met on the crochet cruise, is the fastest crocheter I have ever met. Need something done today… she’s your girl. Last night, I decided to start my adventure on crocheting an afghan that I think is brilliant. Designed by Jessie Rayot for Red Heart Yarns. It’s called In Love with Colour Throw. At the end of the project, it’s supposed to look like this. I know this may sound silly, but remember that afghan seen on the TV show Roseanne. I always loved it. It has a real homey feel to it. This afghan, to me, reminded me of that afghan but with a modern feel and design. When I crochet an afghan such as an assembly piece, I consider myself a one man assembly line. Many years ago, I realized I could speed myself up if I work strategically. While it makes sense to do one complete octagon at a time… truth it, it doesn’t make sense. If you work systematically and do each round of every octagon at the same time, you can control your colours more accurately. You also don’t feel like the project is taking forever. With my type of system. There are 14 octagons here. I complete all round 1’s for each. I then don’t start round 2 until all of the octagons have their round 1’s done. I do this for each round. In essence, the entire afghan grows up together to the size. The reason why this speeds you up is that you remember the pattern. You read the instructions for 1, maybe 2 motifs and you remember it… Once it’s in your head, you will blaze along with no worries of trying to read instructions, hook, watch tv and much more. Your mind knows what to do and your hands are ready for the work. As far as being a speedy crocheter… I’m really not speedy… just determined to not have very many WIPs. I never start a project unless my mind is 100% convinced that I love it first. Tell me, do you have systems that help you crochet? Share with me in the comments below. I will show you an update tomorrow of what I am able to accomplish today. BTW, my colour scheme I am using is different. I have opted to use 11 colours as suggested but not follow the actual colour change suggestions. Either way, I think this design is fabulous. This entry was posted in Advice & Tips, Afghan Patterns, Red Heart Yarns and tagged Afghan, crochet crowd, In Love With Colour, Mikey, Organization, Pattern, Red Heart Yarns, Review, Speed. Bookmark the permalink. I think Mikey is bang on. I like you’re idea and I can’t wait to see the updates. Hi Mikey.I did that same afghan for my niece a few months back but, I never thought to do it the way you are doing it. I’ll have to try it next time to see how it works for me. Love all your creative ideas. I’ve been a crocheter for over 50 years and am still not a fast crocheter. I guess I will never be one but I won’t give it up because of it. The pride you get when each project is done and turns out so well still trills me. So all you beginners hang in there. Whether you are fast or slow doesn’t matter. If it makes you happy just keep on “hooking”. I am not a fast crocheter or knitter now. I think it may be my age 80. I used to do both fairly fast but you know now I think it isn’t relaxing trying to break the sound barrier I just take my time and enjoy watching my craft develop. Hugs to you all and DO enjoy what you are doing. That’s exactly what I did for my first attempt at crocheting a motif piece! I got the idea to create pillow shams for my daughter using red heart’s Wedding Ring Quilt pattern. The result was a beautiful project done in under 5 days (in my spare time at nite). They can fit queen size jumbo pillows! I like granny squares, and long ago hit on this idea. If squares are different color combinations, I do all the ones with the same color, regardless of round, at one time. Then I don’t have to carry along so many skeins of yarn. If the squares are the same combination, I will start with the first color, and crochet as many rounds as needed for the first color. I tie the squares together in groups of 10, to make counting quick and easy. Once I have all the squares started, I don’t have to worry about counting at all. Recently, I started buying those vinyl sweater or blanket covers with zippers, to keep the squares clean and together until I’m ready to sew them together. When the afghan is finished, the vinyl covers make for a nice way to present the afghan to the recipient. Good plan! Where can I find those vinyl zippered covers you mentioned? I love the idea of using vinyl covers. I use them to store afghans during the winter, but never thought of using them to store WIPs. I have never thought of that, but it is a great idea. Especially, as another poster noted, you can take the one colour with you, on the run and not worry about needing another colour while you are gone. Will do this for the next afghan I do! Thanks! This is always what I do. It also works when you make a fitted block. I am constructing a “double Wedding Ring Queen sized Afghan”……..I did all of the octagons, then the bands, next are the eyes and then it will be the square, when I have enough for a strip, then I will join them…..makes it organized, easy to remember and you get a sense of quick accomplishment…..
I’m trying to find a pattern like you mentioned to make for my daughter’s wedding in October. Would you mind sharing where you got the pattern? Thanks. I think the idea of the assembly line is great. I agree that you can be more relaxed on knowing your pattern thoroughly after using this process. I will be doing this next time! I enjoy crocheting, in order to crochet, it has to be fun. Can I go fast, if I want to, but I prefer relaxing, through my projects. I have over 200 projects done already this year, because I relax my way through. I do not like granny squares so I avoid them as much as I can. I have seen that cricketers, but their finished projects look terrible. So faster is not synonymous with good crochet. So impressed about Carla’s 200 completed projects. You go lady! Hope to have 10-15 projects finished this year! BTW I do like the assembly line process! Carla, what is a cricketer? New expression to me. Does it mean fast crocheter? Wow 200 projects. What do you enjoy crocheting most? I am so tired of afghans am into baby things which are new to me. I’m slow because I have made a lot of mistakes but am getting better. I have also been practising new techniques using samplers with notes attached about the technique, yarn or any pertinent info. I keep them in zip lock bags. At the beginning of the year I made something very similar to the Roseanne afghan (I was actually inspired to make it having seen one on The Big Bang Theory) and i ended up building each square in exactly the same way. I found making each full square ended up feeling really tedious, like it was taking too long and zapping all the fun out of it. So I switched to doing just one round at a time until i had all the squares i needed. In no time at all my project was finished and keeping me warm on the sofa of an evening. I don’t understand how you do one round at a time. Do you put a stitch lock or pin on the open stitch. I think I’m mixed up DUH! Thanks for the tip!! I never even thought about doing that…duh. I have the same assembly line approach with one exception. I make one complete motif before I start the assembly line. With the one motif I determine if I really like the design. Sometimes my gage will be off or the holes are too big or small, so I reduce or increase hook size. Also, the picture of the completed project is often draped across a chair and you don’t get the full affect of the pattern. Make one sample motif before you commit to a huge project…..I’ve abandoned a few projects after doing one motif….it pays to do just one! Janet I think your idea of doing a complete motif is brilliant! I will be doing this next time. I do the same thing too. One complete motif and then I start making motifs one round at a time. Works great! I’m a beginner, so am not fast at all. However I did find that when making up a load of squares in 4 different colours, I would work the same colour for a bundle of them and it didn’t matter which round each one was on so it meant I was not chopping and changing all the time and having to think ab9ut which colour was next (I was keeping them in the same colour sequence throughout). I recently made an African Flower afghan for my granddaughter using this process, and it really sped things up. I absolutely love that afghan too! I also crochet one round at a time. I have a flower afghan going now and I’m still making the flower part around all the tiny centers I made earlier. It goes much faster that way for me too. I love finishing each piece, even the weaving in of the ends b/c it makes me feel as though I’m truly making a piece of art. Each step is important to the look of the piece, so I enjoy wielding the scissors , threading the needle and sewing in the ends. I do almost the same thing. If I’m alternating between a neutral yarn and a colorful yarn (for example), I’ll do rounds 1 & 2 in color A, then rounds 3 & 4 in color B — but not do rounds 5 & 6 in color A until I’ve finished all of the motifs for the project. If I don’t yet know which yarn I want to start with for color B, though, then I would do exactly what Mikey does. This worked particularly well for me when I was doing a swap. All the squares used the same colors but the assembly/color changes mixed them up and brought variation to the squares. It was extremely easy to pace myself when I could see at a glance how many more needed to be done. I didn’t keep stopping to count. I usually avoid afghans where you have to sew/crochet squares together, but when i do make them, Ive done it like Mikey said. All of one round first. Its also easier if you take it with you, only one skein of yarn is needed at a time. Love this afghan, might make it to use up stash. 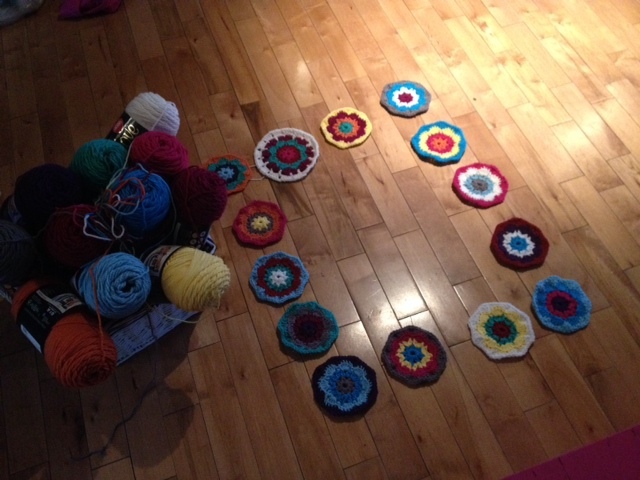 Did you do this on the Happy Hearts Afghan? With that one, not all of the squares are the same design. Thank you! Great idea of doing rounds together. Looks like it would go super fast. A great take along project. This a fabulous idea. I think this is the way to go for an Afghan I am just starting. Lion Brand’s garden PatCH Afghan. I tend to work the same way when making flowers and embellishments especially. I fly through them and if I am making hats…I finish all of the cap parts and then fly through the embellishments. That’s exactly what I do. I worked in a factory in the summers to make money for college. That’s when I experienced in person the genius of the assembly line. I’m looking forward to seeing your project as it grows. I am a lover of lots of color. I am not a fast crocheter, yet. I have to repeat your tutorials many times before it sinks in my brain. I get discouraged, but, I do not give up. Waiting to read your inspirations for a Thursday. Great idea doing them all at once. Can’t wait to see the finished product ! Very good advice! I love this afghan, it has been on my “want to crochet” list since I first saw it. I will definitely use this method when I construct this blanket or any with the motif/granny style. I do the same thing, all the first rounds, then the second, etc. I agree with you, it seems to make it go quicker. Another thing I do is keep all the squares in progress in a plastic shoe box along with the crochet hook and current skein/ball of yarn I am working with. Yes, this means that I have more than one of each size of hook, but at least I can ‘grab and go’ when I get the chance to hook. Everything is right there ready to go. I am using a similar system for my granny blanket, just making stacks of squares up to the 4th row, then completing the 5th as I attach them. I’m doing it that way so I can stack the squares up in the order I need them to follow my set pattern. It’s helping a lot and I’m learning stuff too! Love the idea of doing all the pieces at the same time! Glad to know I’m not the only one who does it that way. I just thought I did it that way out of laziness or ADHD (getting bored and starting on another square). I feel happy when I know that I don’t have to do a certain round again for the whole blanket, I guess you would call it an “early” sense of accomplishment. Even though the whole blanket is not complete, something about the blanket is complete.